The Lunatic Fringe: The 2011 Collection Now Available! – The Lunatic Fringe The Lunatic Fringe | The Lunatic Fringe: The 2011 Collection Now Available! Just in time for the holidays, the Lunatic Fringe 2011 Season is available in book form! 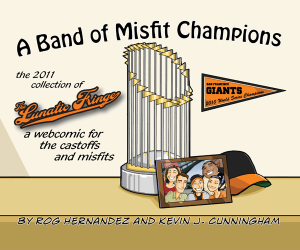 A Band of Misfit Champions collects every comic from the first season of the Lunatic Fringe, from our black & white days right up through the playoffs that the Giants didn’t get to participate in. It includes commentary from both me and Rog about the season, and follows the entire season through its ups and downs. Along with the 116 comics collected through 88 pages, we’ve also included a special feature about the process of making the comic from Rog and myself. We’re selling through Lulu publishers, at a price of $32.95. Pick one up for itself…and maybe one for a Giants fan among your friends and family! You can find the book here at Lulu.com.